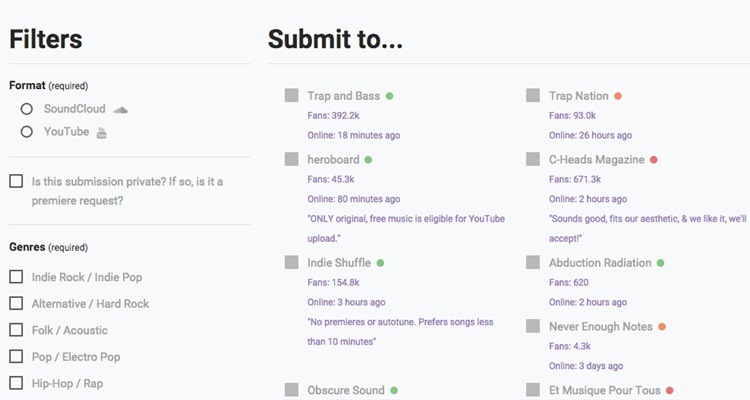 Our new and only way to submit music for review or promotion, in the past we slowed down on the number of submissions received and how much content we put out, but we’re finally back and powered by SubmitHub.com. The goal of the website is to connect artists with music bloggers, playlisters, and record labels. There are two types of credits on SubmitHub: “standard” and “premium.” With premium credits, you can expect to hear back from blogs within 48 hours (96 hours for labels). For a blog to respond, they will need to listen to at least 20 seconds of your song, and if they don’t like it they’ll need to explain why. SubmitHub gives me the content producer and owner of SA Music Scene direct communication with you, the artist. In my personal opinion, someone who is willing to fork out some cash means business, although I’ve opted to accept “standard” and “premium” submissions. It’s also a means of income for the blog if you opt to pay use SubmitHub.com. By creating a system where music bloggers can actually get paid for some of their music blogging tasks, earning a little money to pay for their costs & maybe a little bit extra to put towards their staying alive expenses, SubmitHub has the very real potential to be a much-needed game changer to the music blogging world. Where is the money going that you spend on SA Music Scene? How much money can you make through SubmitHub? I’ve decided to use this platform that myself and others have built to be used as a platform, for any artist no matter what genre or size, therefore, I have decided that after 3months of using SubmitHub.com I will publically display how much not only money was made through the portal but also the exact amount of submissions, approvals and declines have taken place. A blog can only earn as much as is submitted to their blog, so it’s not like there is this unlimited gravy train to hop on board; if no one sends anything to the blog, there’s no money to be made. Which, it should also be noted, makes perfect sense. How do you as the blogger earn money? When someone submits music to my blog, they have two methods for doing so: Standard credits or Premium credits. Standard credits are free, but Premium credits cost money – the majority of which goes to me, the blogger! Note that when I approve a song, there’s a little button that comes up to “mark as shared.” When you do so, the money from the “pending” box will move over to your available cashout balance. What types of releases will SA Music Scene feature? SA Music Scene will give preference to all South African music firstly no matter the genre, thereafter I’ll also identify submissions that might be relevant to the South African current music industry or a track or artist I feel the South African community should know about. Does this mean you can pay for a feature? Yes and no, basically it’s up to me if my sharing can be bought and pushing out more content devalues me/my blog as a tastemaker and therefore I would refrain of accepting too much music. Can I submit via email or other means? SIGN UP TO SUBMITHUB.COM HERE!